Thank-you so much for purchasing a copy of “Poor Strange Girl”. This page contains more in-depth detail about the songs and tunes included on the CD along with lyrics and notation for the tunes and songs. This is based on a song collected by Cecil Sharp in 1917 from Eliza Pace. Eliza was living in Hyden County, Kentucky and was the source of some really great songs. The collected version of this is recorded as “Poor Stranger” and I have adapted both the words and the tune considerably. I met with a fair damsel as she went on her way. I am a poor strange girl and I’m so far from my home. I left my old father, my mother and my home. And now I am a poor strange girl and I’m so far from my home. My parents objected, they said you were too poor. They deemed you unworthy to enter in our door. Since hard times and misfortunes have forced me to stray. Now I am a poor strange girl and I’m so far from my home. To the promise that you made me whilst by my side you sat. And if we never married your heart could never rest. Although your body’s absent my heart is always true. There’s no one in this wide world I love as well as you. Now I am a poor strange girl forever I shall roam. Where the wild geese can see me as they do pass me by. That I am a poor strange girl and I’m so far from my home. There’s a bottle of good whiskey and a bottle of good wine. You drink to your true love and I’ll lament for mine. Saying I am a poor strange girl and I’m so far from my home. I couldn’t care less if I live or die. I’ll love you ’till I’m lifeless, my body entombed. And I’ll always be that strange girl so far from my home. I first heard this song on a record called “True Religion”, by the legendary Erik Darling. I think he had some hand in adapting it from it’s original collected version but it is a traditional song with a few different variants along with some additional verses that are not included in this version. I was actually inspired to learn this song after hearing Beverly Smith sing it unaccompanied at the Ryburn 3 Step folk club. She was staying with Pete and Sue Coe after the club night and, luckily for me, Pete recorded and “collected” (nicked) the song from her and passed it on to me. I have adapted it slightly by repeating the first verse as a chorus so that there’s plenty of opportunity to sing along! Ah, but the sky’s so blues. Just what love could do. Swallowed that poor bird whole. Just as I mourn for mine. They might break in two, in two. They might break in two. And there’s gold in the rising sun, oh sun. Gold in the rising sun. The first tune in this set was inspired by this verse from Bob Pegg’s song “The Stone Head” which was written as part of the Calderdale Songs Project. He crept from the mist like a thief. He left a lark shut in a cage for musical relief. But I wouldn’t heed it, I didn’t need it, to ease my day along. As far as I understand larkmen indulged in this hobby whereby larks would be trained to replicate the songs of wild larks on command so that they could be entered into lark-singing competitions. A young lark would be shut into a little wooden box, taken up to the moors and secreted in a safe place so that they could hear and therefore learn the songs of the wild moorland larks. These birds would then be presented at competitions to be judged by larkmen from different regions, on the quality of the singing and the number of different calls replicated. The second tune was named after a tree that is situated near to the River Ryburn in the village of Triangle, West Yorkshire. A dear friend of mine had once explained to me that he saw herons as a good omen and that they represented a kind of guardian like presence in his life. Eerily, ever since he told me this, I have found that I see heron’s at points in my life where I hope for good omens. This is likely due to the fact that the Ryburn valley is an area in which herons thrive but I also like to see them as a positive symbol. On one particular day, when pondering a particularly difficult decision, I spotted an entire tree of nesting herons: resembling branch upon branch of tattered umbrellas, I took it to be affirmation of what I can thankfully say was the best decision I have made in a very long time. This tune is dedicated to the memory of Dave Eckersley of Herron Publishing. The theme of this song is one that is surprisingly common in folk music. There is no explanation as to what causes the lady in this tale to commit such a horrific act but one can imagine she must have found herself in a somewhat desperate situation. This version of the ballad has been heavily adapted with the words coming from a number of different sources. All down by the greenwood side. 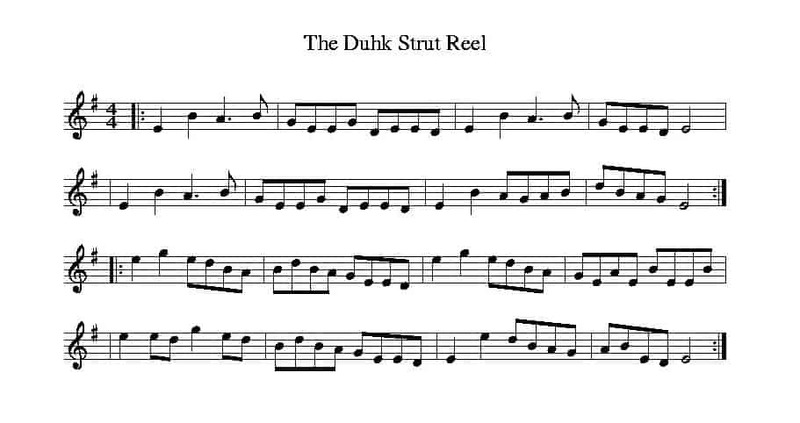 This song is taken from the Frank Kidson publication “Traditional Tunes”. It was collected from Mrs Holt who was a resident in Alderhill, Meanwood. She remembered it as “being sung in Stockport in about 1838. I have been lucky enough to have spent the last few years researching and working on songs from Frank Kidson’s collection along with folk legend Pete Coe. It is an absolute treasure trove of material that continues to yield interesting and unusual versions of songs both familiar and unfamiliar to me. This song stood out for me particularly because the situation is entirely controlled by the female. 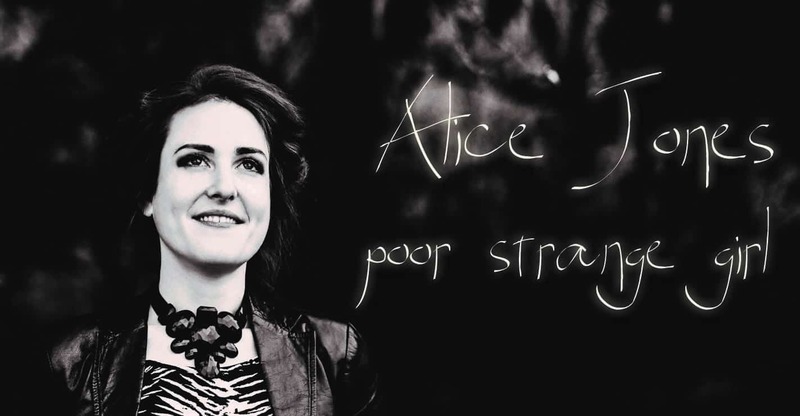 She plays the role of the philanderer and abandons her true love in favour of a more appealing suitor she bumps into whilst in the woods… a most uncommon folk song denouement! Down by the green bushes where she chanced to meet me. Down by the green bushes where he vowed to meet me. Forsake your own true love and marry with me. I’ll forsake my own true love and I’ll marry with thee. Down by the green bushes where he thinks he’ll meet me. Adieu the green bushes forever said he. Adieu the green bushes it’s time to give o’er. 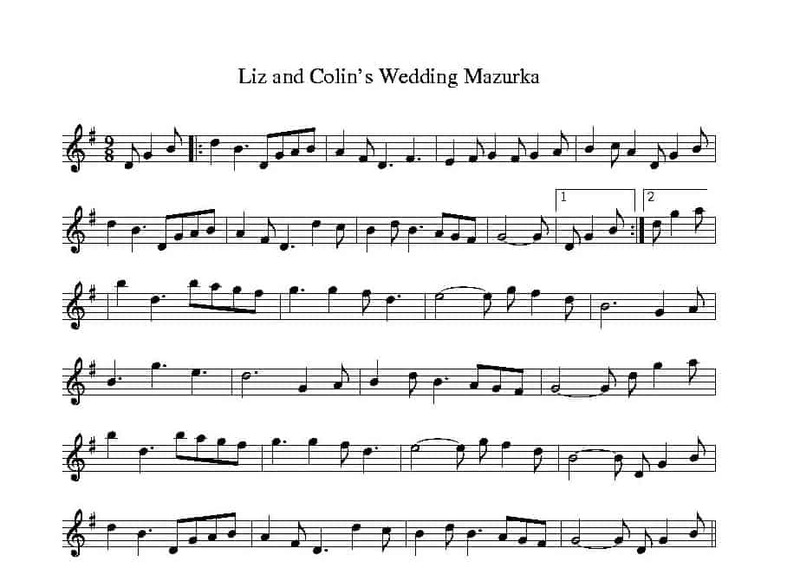 I wrote these two tunes as wedding presents for dear friends. The first tune was written for Liz and Colin Cryer who are long-standing members of the Ryburn Longsword clan. 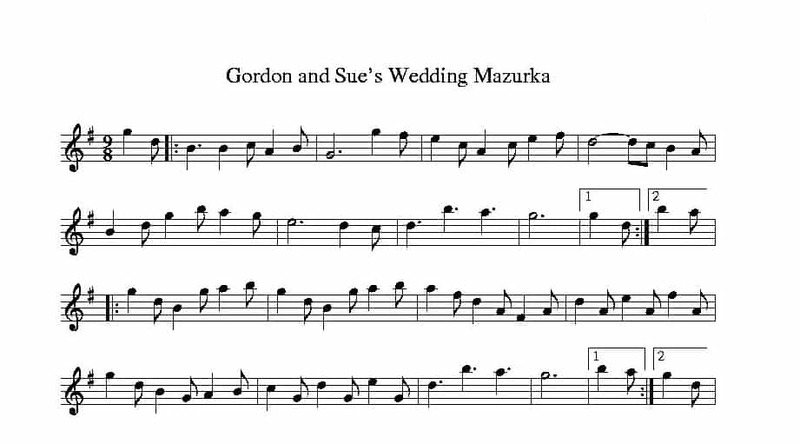 The second tune I wrote for Gordon and Sue Wood who are fabulous dancers and keen supporters of the local live music and dance scene. I found this song in the collection of Frank and Anne Warner. It was sung to them by sisters Eleazar Tillet and Martha Etheridge in 1951 who learnt it from Eleazar’s husband “Tink”. Eleazar and her husband were a rich source of interesting songs some of which could be traced back to not-so-traditional sources. This song was published in a book called “Heart Songs Dear to the American People” and is often cited as a civil war song. I have again, adapted the structure of the song to allow for extra opportunity to join in with choruses! But the struggle was in vain. Sweet dreams my senses fill. This is another song from the Frank Kidson collection. I found it amongst his vast collection of broadsides. May let us meet again. The first tune of this set is a beautiful polska written by Göran Fredrikson who I first came across as part of the Swedish supergroup Blå Bergens Borduner. It also features on an excellent album by fellow band member Anders Norudde called “Kan Själv!”. I am a massive fan of Scandinavian music and dancing and I play this tune for dancing at any opportunity I get! The second tune of the set was written for my good friend and virtuoso banjo-player, Leonard Podolak after a particularly fabulous weekend at Shrewsbury Folk Festival 2014. His playing makes me want to dance and never stop! This is a song that I got from Gina Le Faux when I was in a trio with her and superb double bassist Hugh Bradley (who just happens to feature on this album!). I have adapted the words based on various versions. It seems that this story is frighteningly relevant again today in light of recessions and such hardships of recent years. Six horses to draw me along. That I know not which way I can turn. Here’s adieu to some thousands of pounds. Then my sorrows would then have had bounds. The best of good beer brimming brown. That floweth from town unto town. The best of good bread only white. And I’m glad that I have it to bite. Once I was housed as the best. The pig sty to shelter my head. To keep my poor bones from the ground. Kind neighbours my story is done. This is another song taken from the collection of Frank and Anne Warner. It was collected from the wonderful Lena Bourne Fish in 1940. I have adapted the tune a little and I wrote much of the second half of the song as the version of the words printed in the book do not include the additional parrot-based verses. And you my bride shall be. In my castle by the sea. Which you can claim today. The milk-white and the grey. Him on the turban grey. Or so I’ve heard them say. They looked so dark and cold. With her ten thousand pounds in gold. And the next one you shall be. And lay them here by me. For to rot in the briny sea. Your back to the yonder tree. A naked woman should see. And she’s chucked him in the sea. Lie there, lie there you false young man. Drown in place of me. Go and keep them company. That grew at her father’s gate. Just two hours before day break. It began to flutter and cry. That you’re out so long this night. Don’t tell tales on me. Or seen or done this day. Whose intentions were so bold. At least that’s what I shall say. Well done, well done cried she. And your doors of the best ivory. Sets out from her door. Along the wild sea shore. Well his bones have turned to mould. I first heard this song at a “Ryburn 3 Step Concert Party” performed by Pete Coe, Chris Coe and Johnny Adams of The New Victory Band. It was a very popular song during the First World War and was recorded many times by many different people, featuring most notably in “Oh What A Lovely War”. This version, however, was taught to Pete and Chris Coe by Chris’ mum Kath Richards. I grew up in a terraced house in Ripponden three doors away from the house where Pete and Chris lived and when I was about six-years old Kath moved up from Birmingham, into the house next-door to us. Kath was more than a neighbour though, she quickly became the beloved “terrace Gran” to all the children on the terrace; she looked after my brother and me after school, advised my Mum on meat (having been a first class butcher herself) and most of all was a friend, great supporter and companion to us all. I don’t remember ever hearing her sing but she had a couple of songs in her repertoire and this was one of them. This song is dedicated to her memory. I will miss Kath forever and I will always be thinking of her whenever I sing it. Just to bring you back to me. Where the nightingales are singing and the white moon beams. There’s a long, long night a-waiting until my dreams all come true. And that’s the day that I’ll be going down that long, long trail with you. When I think I see you smile. Mum and Dad for… well everything really! Jon Loomes for his excellent recording expertise, Tom Kitching for being an amazing fiddle player and all around brill person to work with, Hugh Bradley for his funky bass input and fellow coffee snobbery, Murray Grainger for his visual and creative skills, David Crickmore for all his advice, mastering assistance and general support, Neil Ferguson for his mastering services, Elly Lucas for taking photographs of me that actually make me look normal! Pete and Sue Coe for their endless support and inspiration, Gill Loomes for the coffee, hoummous and chatting, Ryburn 3 Step and all the fabulous friends and supporters, Michael Beeke for his listening services and counselling support!